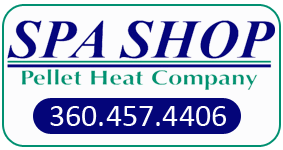 The Spa Shop can custom order replacement covers for ANY SPA. We offer custom made covers to replace your damaged or worn out spa cover. One of our helpful service people can assist you in sizing your new cover or you can view a short video using the links below the photo on the right that will assist you in measuring your own spa. We have provided an online form below to assist you in providing us with necessary information to order your replacement spa cover. Follow the cover measuring instructions on the video or call the Spa Shop for instructions. Click on the button at the bottom to email the order form to the Spa Shop. Wait! You May Not Need to Complete the Form that Follows! Customers who own any Hot Spring, Tiger River, Hot Spot, Solana, or 2002 or newer Caldera Spa do not need to measure their spa. Please call us with the model and serial number, 457-4406 or stop by 230-C East First St., Port Angeles, Washington. To order a new or replacement spa cover for any brand spa please fill in the following form. When completed click on the button at the bottom of the form and your information will be added to an email message to the Spa Shop. Please identify the shape of your spa / hot tub by looking at the images below, then select your shape from the drop-down that follows. If your spa has rounded corners, you will need to provide the radius of your corners as well. Please complete all of the following fields that are applicable for your spa. Please select the color of your spa/hot tub cover by looking at the images below, then select your color choice from the drop-down that follows.
! Email or call if direction of hinge is critical.
! Email or call if placement of fasteners and handles is critical.